My usual Day of Rest. Thought about running long this morning, but I simply had too much to do before work and couldn’t go in late. Not sure what i’ll end up doing tomorrow morning for a workout. Will be at BFF’s house. I’ve run long there before around the city streets. Not too bad I guess. I don’t plan on going too far, but I’d like to do something. If not, there is a Gold’s down the street. Long busy day at work. Headed North to get sister, then Dan, then turned around and headed south for BFF’s house. Because of traffic, didn’t get into town until 8:30 pm! River all day tomorrow with our friends and the Austin Auburn Club, Micky and the Motorcars at Gruene Hall on Saturday night. Hopefully get back early on Sunday. Dan is on a work trip most of next week and I have a VERY full work and after-work calendar next week. Dinner: Rudy’s BBQ, one of my favorites. Smoked turkey plate with extra pickles and onions. Hit the gym for strength before work. Glad at least the strength training workouts are decent lately. No run after work, I was so drained from the day. Stopped at AK’s to check on her house and kitty, ran errands, then headed home. It was late when I got home and I still needed to do something about dinner and pack my weekend bags. Honestly not sure how anyone has tolerated me lately. I am grumpy and argumentative all of the time. I am just so ready to figure something out. Just over a week before I see the Dr. again. Trying to be patient. 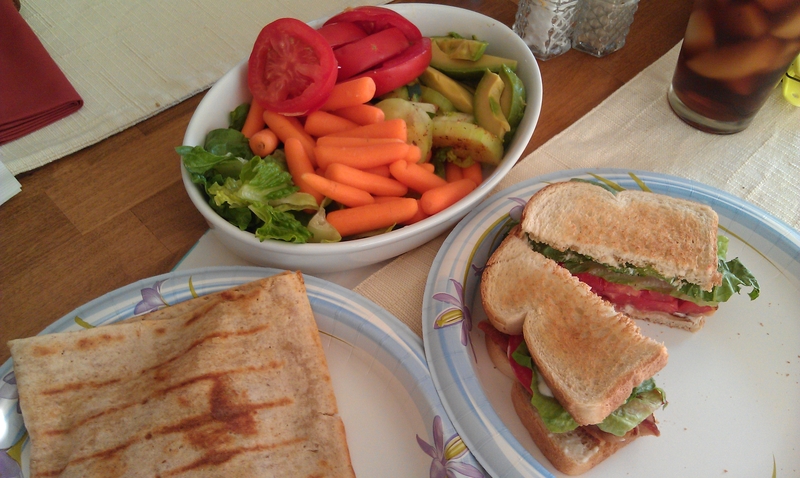 Dinner: grilled turkey/avocado/hummus lavash, assorted veggies (farm fresh tomatoes, cucumber salad, carrots, red onions, and avocado). Dan had a BLT instead of a panini. Ran before work. Possibly the worst run ever though, just going to leave it at that. I’m not going to lie, I have cried a lot in the last month to Dan. I cried this morning before leaving for work when he asked about my run. I am SO tired of feeling this way and not knowing what’s wrong. Is it IBS? Is it a food intolerance? Is it gluten intolerance? Is it something else? I’m sitting here with a giant lump in my right side, as I type. Doesn’t happen everyday, but it’s annoying. Whatever happens on a daily basis is never the same, but it’s always annoying. Dr.’s office called again today (guess they are calling as the panels come in?). No celiac, which I expected. But I also know that this method is inaccurate at least 80 percent of the time (from medical journal research). My money isn’t on it being this, i’m just saying I figured it would come back negative. And that doesn’t rule out intolerance, which is different. Once again nurse said, ” he wants to talk to you about this on the 20th”. Snack: Chia Peach Cobbler without any nut-butter (wasn’t sure it was necessary, may try again soon with it). Dan is still scarred for life that I called it that in the grocery store on Sunday, he said people looked at me weird. He even polled his co-workers and they agreed that “nut butter” is dirty. Ok, I will use the name of the nut from now on….gutter-brain boys! 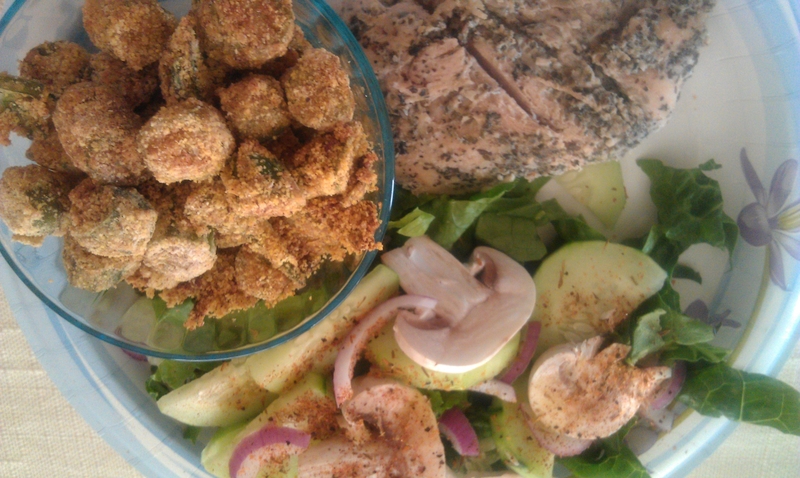 Dinner: Pesto Chicken (from HEB grocery near the fajitas), salad, oven fried okra. I miss iced tea the most. I simply cannot drink cold tea with nothing in it. So i’ve been drinking water, which is better anyhow. I still miss it though. I liked the chicken, it was really good. I had wanted to grill it, but with our patio being full sun in the evening and it being over 100 degrees? No thank you. Next time I will grill, because I think it would bring out the flavors even more. Okra was good, but next time I am using more spices. I put cayenne, garlic powder, pepper, and salt in with the okra. Dr.’s office called. Said to keep my June 20 follow-up to discuss. The only thing she mentioned is that my cholesterol is on the high side of normal, she said we’d talk about all of the rest later. This ruined my day. Maybe it’s silly, but I was the only one in my family that didn’t have that problem. I know it’s genetic and sometimes you can’t get away from it. I’m still mad. And now I want to kick my Dr. for making the comment, “i’d be really shocked if your cholesterol isn’t in line”, especially with your diet and exercise. I reminded him that my parents and my sister all have the problem. Guess we’ll discuss when I go in. The nurse said he’s not concerned about it though. 2-a-day Tuesday. Just don’t like my cardio and full body weights together. I ‘m glad I am doing the 2-a-days again on Tue and Thur, like I used to. Weights before work today. Surprisingly good considering I haven’t been sleeping lately and I was fighting to stay awake on the drive to Austin. I did have to skip those burpees, the pain in my lower right side is just too much when I do them. Don’t feel it at rest though. After work, I went to AK’s (who BQ’d again in San Diego), to check on her house and kitty. Left the car there and ran at Brushy Creek (she lives very close). Running while you are pissed off in weather that is too hot isn’t the smartest idea. Nothing happened, it just isn’t smart. 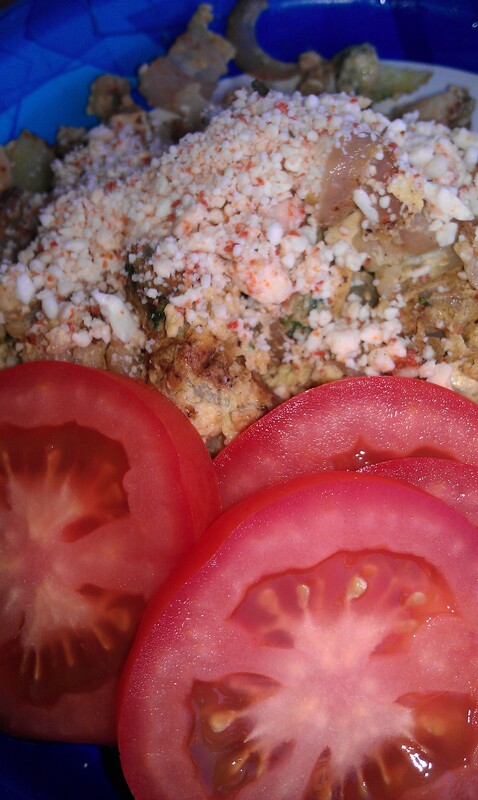 Post-workout: Green Vegetarian’s migas (recipe from the restaurant in SA). They were good, but not filling, I think I should have bulked it more with vegetables or added a side of refried beans like suggested. I will have to post this one, it’s a keeper. 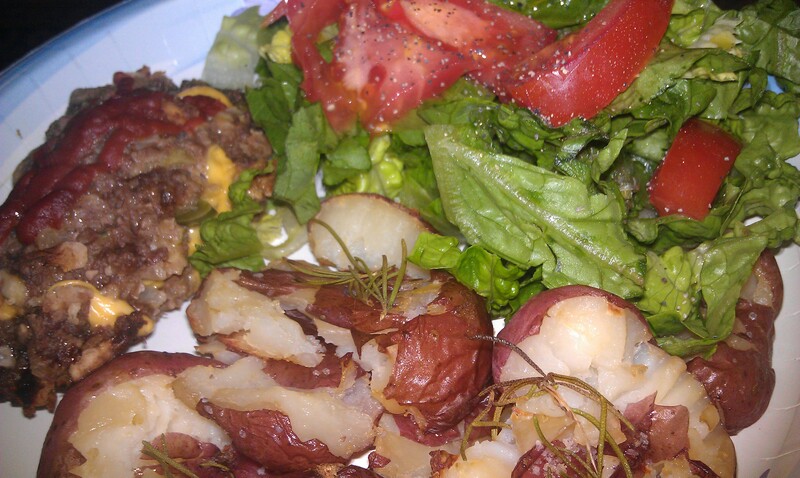 Dinner: Leftover cheeseburger meatloaf, salad, crash hot potatoes (crashed the boiled from the night before). Dan told me he likes boiled better (probably because I used rosemary on the crashed, which he doesn’t like). HUMPF! Hot crash potatoes >regular new potatoes for sure. The only reason I didn’t make them that way the first night, was because it would have taken an extra 25 minutes I didn’t have. Cardio cross after work. I guess it had been a while since I spent time on the stairmill on a Monday. Good old drowning in sweat workout. Day 6 of the challenge. Although I had all of my meals planned out today, the first bite of food I had today was a piece of chocolate. I had all of my blood work done today (5 vials, OUCH!) I was fine until I went to leave (about 10 minutes after they were done) then I got hot and dizzy. Ate the piece of chocolate and sat down for a while in front of the hospital until I felt fine to drive. I knew what I needed to do, i’ve passed out twice before after needles. I didn’t even look, guess my blood pressure went nuts anyhow. Breakfast #1- Latte with skim milk from Starbucks. No soy, theirs is vanilla and has added sugar. Just skim milk latte, no flavoring. Note: I do not like plain unsweetened lattes, as I discovered today. I drank it anyhow, I needed something in my system. Breakfast #2- Overnight chia yogurt with pineapple. 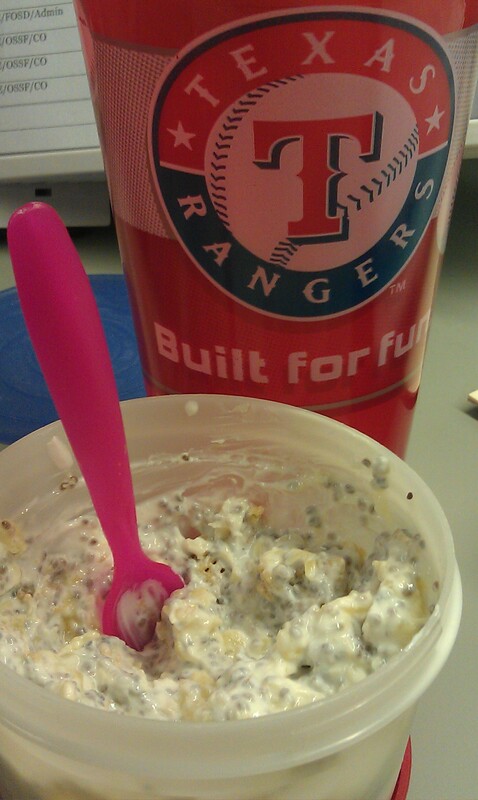 I love my “built for fun” Texas Rangers cup! 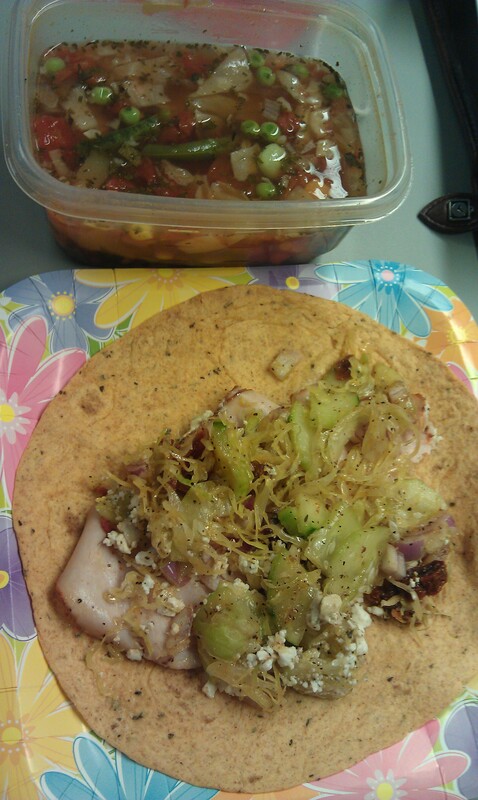 Lunch- Sunny Mediterranean Wrap, bowl vegetable soup. As you can see, the insides of the wrap aren’t pretty, but gosh, after the onion, oil, cucumber, spices and sun-dried tomatoes marinated overnight, it was even better as a leftover! So the blood work is done. Follow-up appointment with the new PCP in 2 weeks. How I feel seems to change on a day-by-day basis. I have a weird soreness now in my side, hurts to do burpees or anything else that engages my core, so that has been cut out. Not the same soreness I get 1 or 2 times a week, where my stomach is sore from being distended so much. Moving forward. Hopefully blood work gives an indication of which way to go. For the 2nd Sunday in a row, I did a “Body by Melissa” workout by a pool. That is what I decided to call my “I don’t have a place to lift weights today, so this is the next best thing” workout. I used the table, chairs, pool deck, gym towel, and my own body weight. Dips, lunges, triple-lunge series, chair push ups, split lunges, squat jacks, burpees, mountain climbers, grapevines, high knees, and some stuff I can’t remember. Last weekend I didn’t have a gym, this weekend I had a sorry excuse for a gym at the hotel (bike and treadmill). 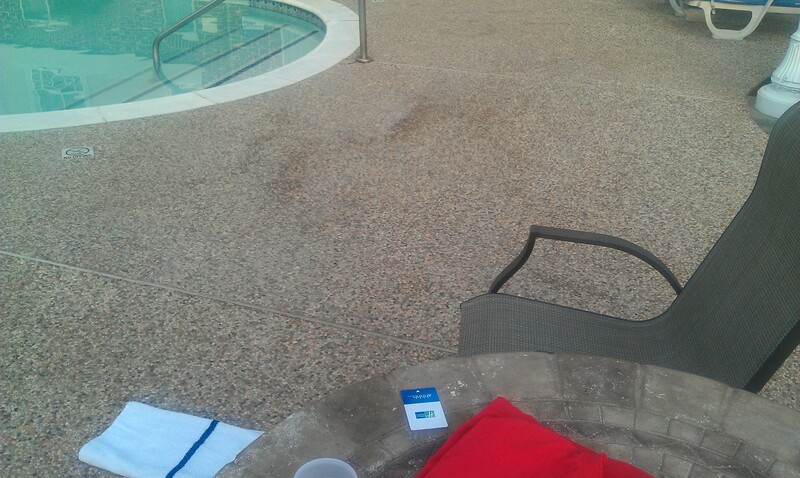 I warmed up for 5 minutes on the bike before I hit the pavement by the pool. I actually had 2 boo-boos yesterday, my buddy June pointed out I forgot about the BBQ sauce. I was concentrating so hard on avoiding it in the salad dressing and they didn’t have EVOO, so I opted for bbq sauce instead. DOH! Breakfast: I love Holiday Inn Express Breakfast, because there are so many things to chose from and you can mix and match galore. 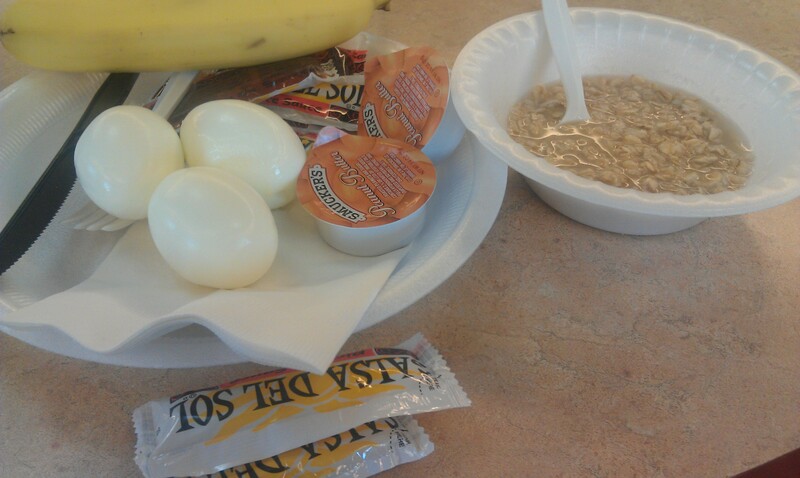 I usually have fruit, oats, yogurt, maybe eggs. 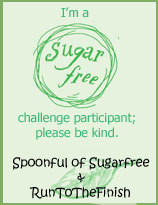 No yogurt, it had added sugar or artificial sweetener. I actually swiped the peanut butter for my emergency stash at work (post-challenge) and the banana to eat as a snack on the road. I don’t usually eat packaged PB, but it’s good to have in the emergency stash. 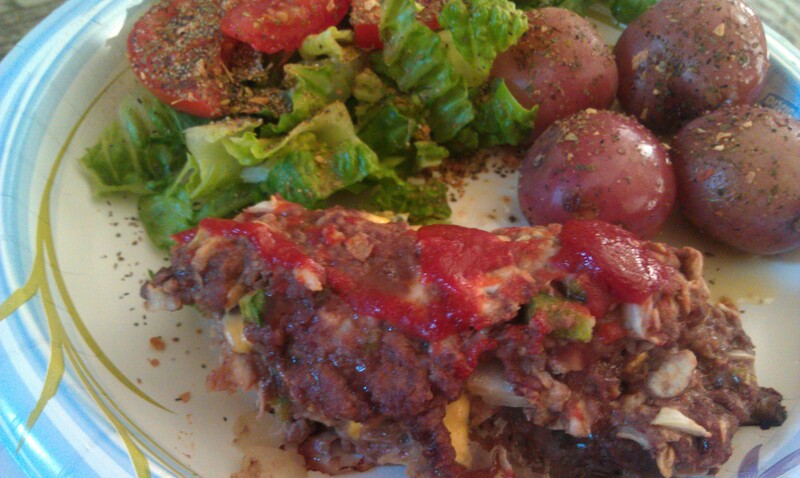 Breakfast today was probably closer to looking like “pig-slop” than Saturday’s dinner. I decided I wanted savory oatmeal. 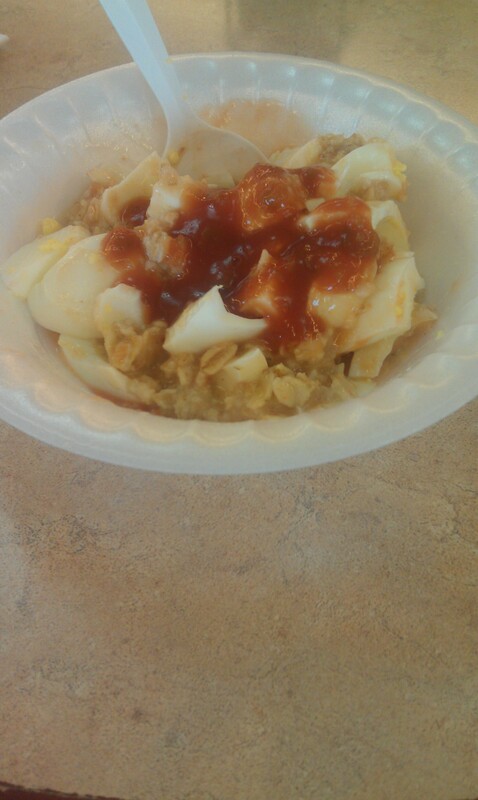 So I had plain oats with 3 egg whites and picante sauce. Sounds and looks gross, tastes great and has great staying power because of the protein-carb mix. It’s a good thing Dan was still in bed when I ate my breakfast, he would have made some horrid comments. In fact, I was shopping for dishes at Target next door when he woke up. He didn’t sleep as late as usual, but i’d already worked out, showered, got a few things from Walmart, and was in Target. 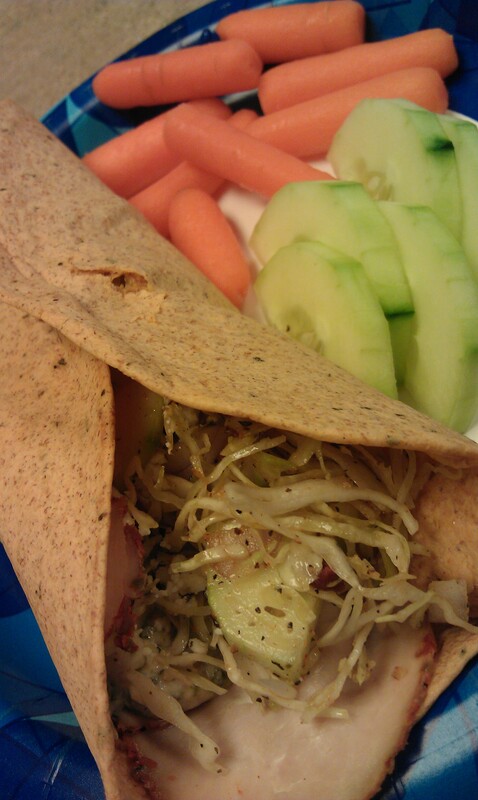 Lunch: Sunny mediterranean wrap (recipe below), cucumbers, carrots. Lots of strawberries. I saw the recipe for the wrap in the “HEB showtime” magazine and decided I wanted to try it, plus I had everything at home, except the meat and wraps, which I was getting anyhow. Found wraps with no added sugar or artifical sugar, although it took a while. Dinner: Wasn’t feeling so great, maybe I shouldn’t have eaten all those strawberries (oops). Made chalupas for dinner for Dan. I thawed some homemade tortilla soup from the freezer for myself, added chips and cheese. Place coleslaw in a mixing bowl with tomatoes, olives, cucumber and onion. Toss with dressing or oil; add salt and pepper, to taste. Set aside. Heat wraps in a large skillet. Spread 1 Tablespoon of pesto over top of each wrap. Layer meat and coleslaw mixture down center of each wrap; top each with 2 Tablespoon feta cheese. Fold ends toward centers and roll up tightly to make a wrap. Cut wraps diagonally in the centers and serve at room temperature. *I skipped olives, I don’t really care for them. Opted for the EVOO instead of italian dressing. I used 2 oz of turkey on my wrap, and flavored hummus instead of pesto. All combined together, it was very tasty. I made enough filling for all 4 servings, had 1 for lunch, the other 3 will be work lunches for Monday-Wednesday. 6 WW P+ with the ingredients I used and some GHGs to boot! I used regular feta, but you could use RF or FF if you wanted. Day of rest for me, like most Fridays. When I say rest, I mean from working out, lol. I was going to work from home on Friday because my new fabulous Energy Star dishwasher was being delivered. YAY! (this is a big deal, i’ve wanted a new dishwasher since we’ve moved in 2.5 years ago). I run the dishwasher just about everyday. No, i’m not lazy, I like the clean a dishwasher gives you and I cook almost everyday or have dishes from my workday food. And I HATE stuff on my countertop, I have a folding dish rack under the counter, which I only use a few times a year. I asked for the day off instead. I had the dishwasher, irrigation system tech, and a cleaning service all come out. I want to have someone help me with the house SO bad, but good grief, it’s really expensive. I’m not lazy, I’m just a morning person. I really only clean before work or working out or on weekend mornings on the rare occasion we are actually at home. It’s hard keeping a big house clean by myself. Makes me feel a little guilty that I want help, but I can’t stand getting behind on that. 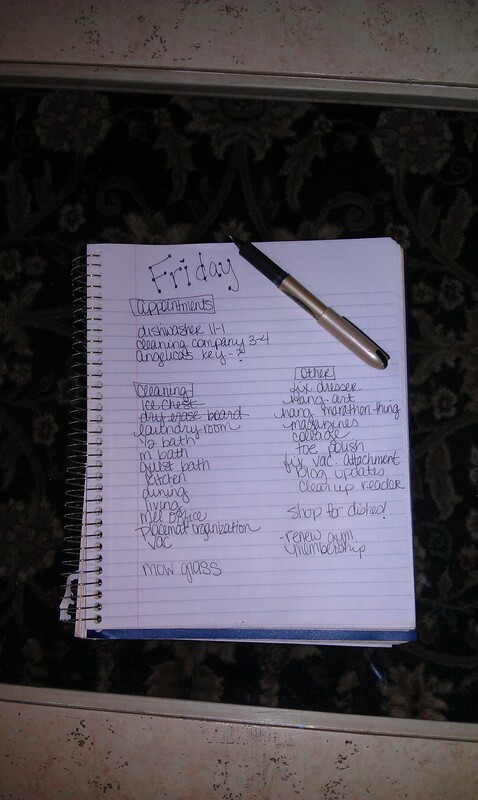 I think i’m going to shop around before I make a decision. And afterall, I do pay the irrigation tech to help with the sprinklers, although I am fully capable of doing that myself. I’ve had the professional training, I just don’t think I could do it as well and therefore pay a professional to do it. There are just some things that are worth spending money on to have them save you time and have them done correctly. Although someone I know has been putting almond butter on his waffles every morning, so we are running out. I want to send him for more, but that is a dangerous chore, because he’ll come back with $50 worth of stuff that neither one of us needs. Drinking more water, I just don’t like iced tea by itself. 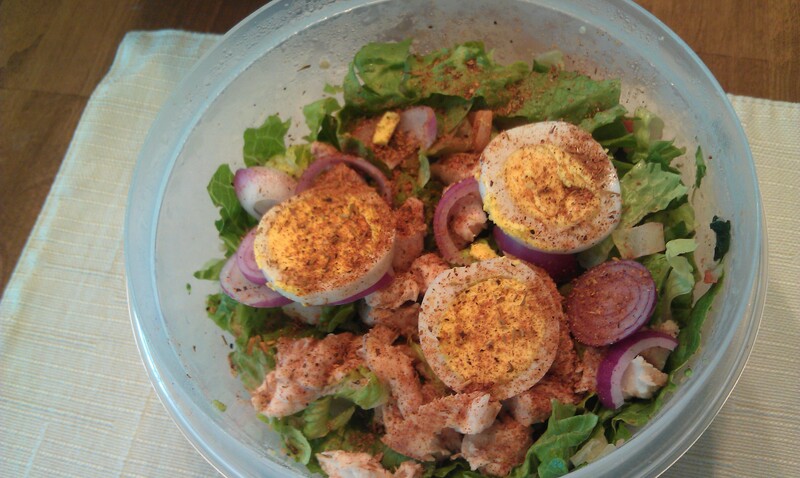 Lunch: Same salad as yesterday, but with grilled chicken, EVOO, and egg. And baby red onions from my dad’s garden. Dinner: We were actually at home, so I wanted to do watch Friday Night Lights when it came on (instead of a week later on DVR) and have “high school football” food. 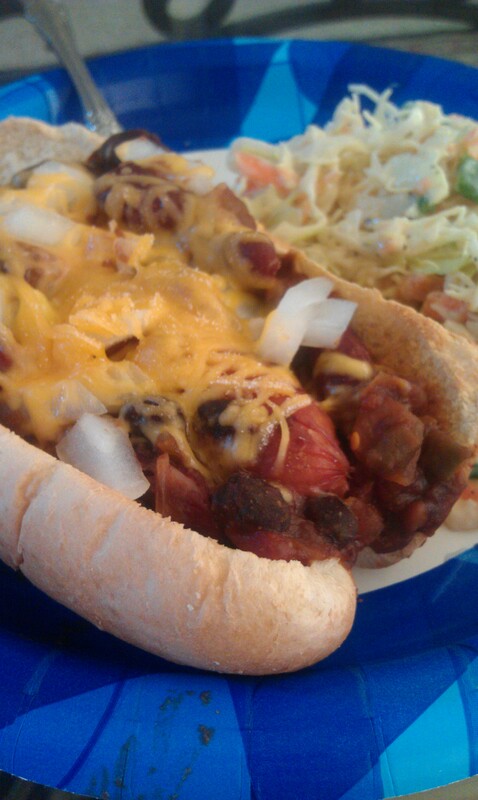 Chili cheese dogs! (I am VERY picky about lunch meat and hot dogs). I keep Whitewheat burger and dog buns in the freezer for Dan, so I had everything on hand. I ate two (the first one didn’t even make it on the plate, oops! ), plus some slaw I threw together (cabbage, carrots, green onions, Dijon mustard, and yogurt). Slaw was 1P+. Chili dogs were 6P+ each. I didn’t use whole servings of chili or cheese. Onions from dad’s garden and mustard to dress them up. Made vegetarian chili to go on them, new recipe, super easy. Will freeze leftovers, maybe use somehow for next week’s lunches. It made about 6 one cup servings. In a large pot, add olive oil and warm over medium heat. Add onion, peppers, and garlic. Saute for 5 minutes or until softened. Add beer and stir well. Add tomatoes, black beans and kidney beans, stirring well to combine. Add cumin, chili powder, hot sauce and salt. Stir in refried beans to thicken chili. Reduce heat to low and simmer for 15 minutes.